If you would like to comment on any of these items, click on the 'Click here to comment' link. Note: to comment, you must be a registered user. You can register via the Contact or Facebook links, or you can register online using the Join Us link. You can also express your liking for any particular news story by clicking on 'Click here to like this item'. All visitors are free to use this facility. 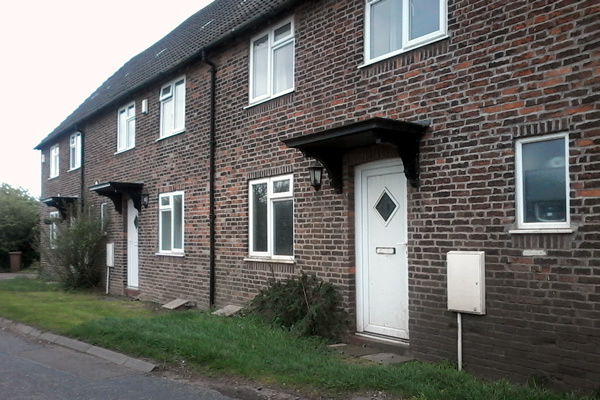 The Pinglefield Murders occurred in Shenstone in 1929 after a farm labourer, Henry Sims, appeared to have a psychotic breakdown. This resulted in the tragic deaths of three innocent people including a child and the suicide of the perpetrator. Read more by taking this link. 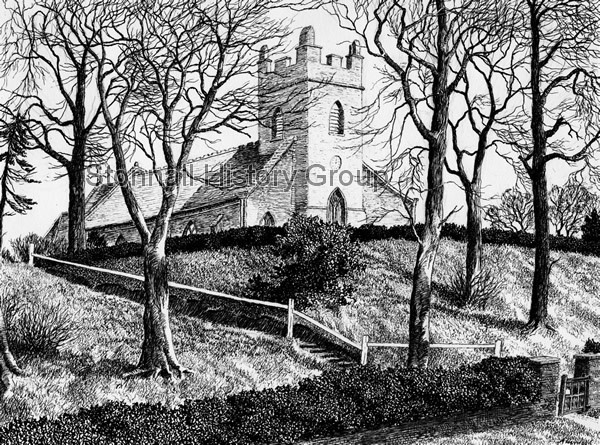 Alan was a very talented illustrator and Peg was active in Stonnall Women's Institute for many years. Read more by taking this link. 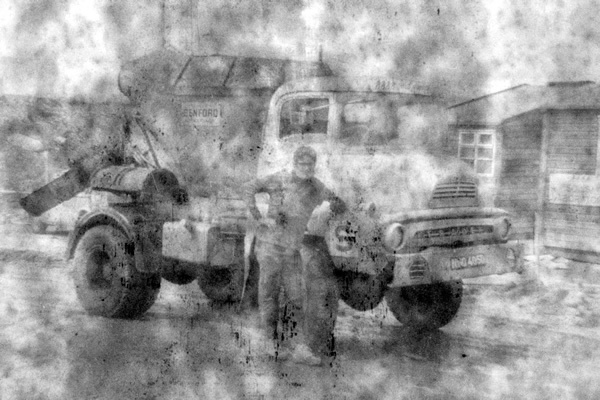 Julian describes his experiences while working on the construction of the new motorways, the M6 and the Aston Expressway in the late 1960s. Read more by taking this link. 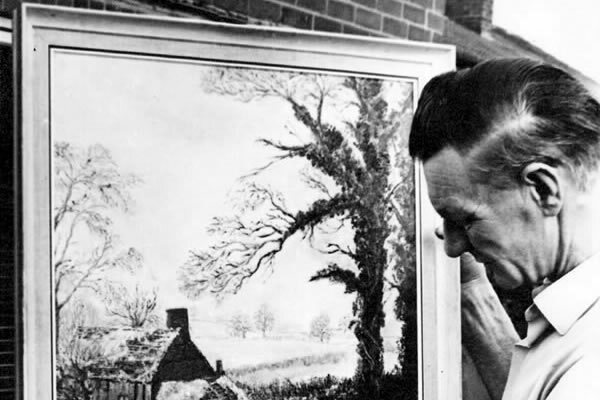 Vic Nicholls was a very talented Stonnall-based artist, who was active in the 1950s, 60s and 70s, with success in London and Paris. Read more by taking this link. This new game gives you a very generous 5 minutes to sort the letters of our favourite subject after they have been jumbled up. Play the game here. 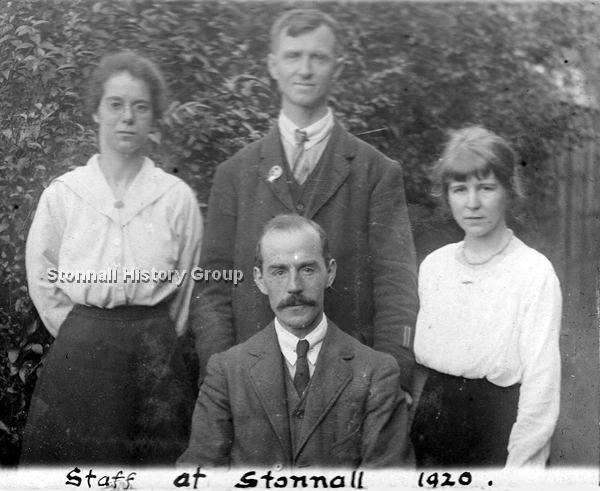 A photo found in an old album at an auction shows the staff at St Peter's School, Stonnall, in 1920. Hopefully, we will be able to identify these teachers eventually. A shoe has been found hidden under some floorboards at the Manor House, Stonnall. It is believed to be an example of the Concealed Shoe custom. It is an infant's shoe, probably a girl's and shows signs of wear and tear. It has two pearl buttons. Judging by its style, wear and manufacture, it appears to have been made in about 1850 and hidden about 20 years later. The Wright family was resident at the house for most of the 19th century. Northampton Museum keeps a register of concealed shoes. 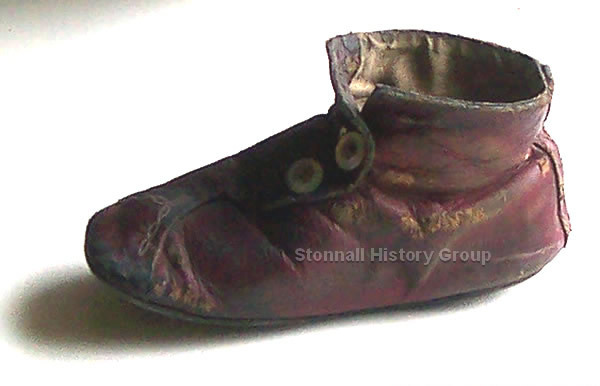 A total of 1,900 examples have been recorded from the UK with several more notified from North America, Europe and Australia.I contacted the Historic Environment Record Officer at Staffordshire County Council and she replied that this is, as far as they know, the only example of a concealed shoe to be found in the county. So it really is a notable find. Shenstone Railway Station, as seen from the Shenstone village side, as it was 33 years after it was opened in 1884. It was originally intended to serve the extension of the London and North Western Railway between Sutton Coldfield and Lichfield. It is now part of the Cross City Line between Redditch and Lichfield Trent Valley. The photo is remarkable for the absence of housing around the station. Buildings at the end of Ashcroft Lane are visible in the background.